On July 26, Israeli police demolished 45 buildings in the unrecognized Bedouin village of al-Arakib, razing the entire village to the ground to make way for a Jewish National Fund forest. The destruction was part of a larger project to force the Bedouin community of the Negev away from their ancestral lands and into seven Indian reservation-style communities the Israeli government has constructed for them. The land will then be open for Jewish settlers, including young couples in the army and those who may someday be evacuated from the West Bank after a peace treaty is signed. For now, the Israeli government intends to uproot as many villages as possible and erase them from the map by establishing “facts on the ground” in the form of JNF forests. (See video of of al-Arakib’s demolition here). 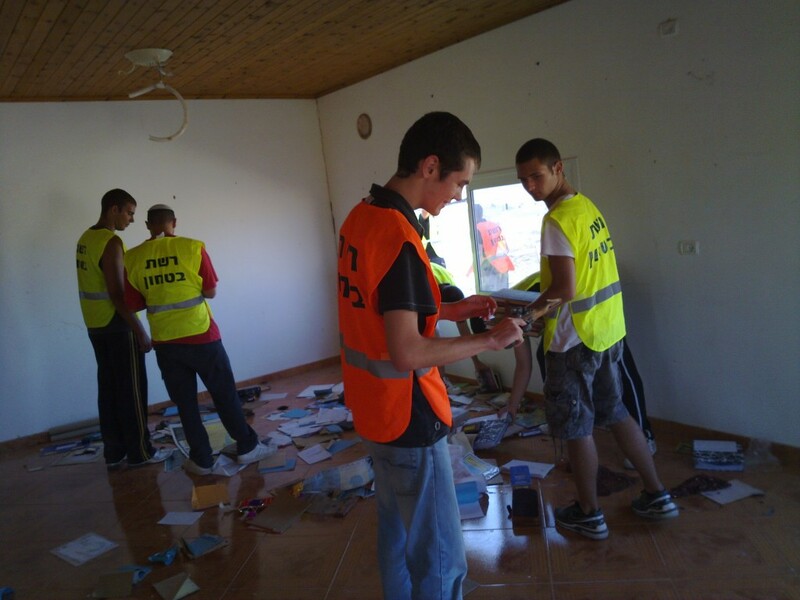 Moments before the destruction of the Bedouin village of al-Arakib, Israeli high school age police volunteers lounge on furniture taken from a family's home. [The following four photos are by Ata Abu Madyam of Arab Negev News. Heartbreaking and disgusting, all at once. As always, thank you for sharing this, Max. The people traumatized have been greatly harmed, they will suffer from depression, PTSD, anxiety, stress kills. These young volunteers were harmed too, their souls were killed. The only vaguely optimistic thing to say about this sickening stuff is that the more of it they do, the less international support they will have; and the less credibility the people will have who blindly defend them. Alan Dershowitz, for example, wrote about ethnic clenzing that “political solutions often require the movement of people and such movement is not always voluntary.” One should send this story around to the usual crowd to draw some insensitive comments. The only question is whether the Palestinian community can bear the suffering while Israel gradually erodes its own international standing. This differs from Kristallnacht how? Shocking it may be, but it should come as no surprise that the upper echelon of Education Ministry is as putrid as the rest of the government. 10th, 11th and 12th grade students do not have classes which relate to current affairs; even if they did, too many of them would have teachers who would be inadequate, or worse, to the task of properly educating our kids. Of equal concern are the number of right-wing parents who obviously must be proud of their children’s actions as they help the on going Jewish colonization of Baudouin land. All through the 1980s I reported on Israel and West Bank. In 1982 I reported on attitudes of Israelis towards Arabs in general, Palestinians in particular. The results of the poll: shocking. The younger the Israeli Jew, the more racist he/she was. Things have only worserned until the entire country now shares opinions that, in the ’80s, used to be seen as “lunatic fringe.” As commentator above notes, the US enables all of Israel’s crimes against humanity. I am sorry to feel that if we sent Obama’s aides this story, Obama would do exactly nothing. Why? He is only one of a long line of imperial Presidents, beholden only to corporate and state power. 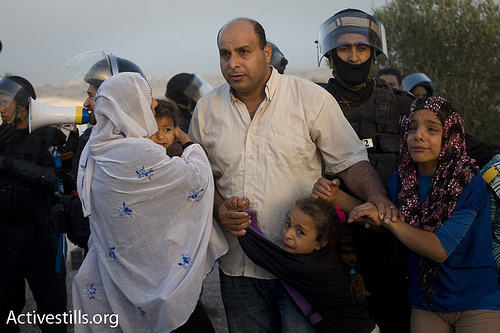 Bedouins and Palestinians – “the natives” – are weak, therefore expendable. Israeli arms and electronics development, and Israel itself, represent Growth, our great Assets, therefore not expendable. Nonetheless we should protest. It would be very nice if our movement didn’t split hairs about “one state/two states,” “the Lobby,” etcetera, and focused on Israel’s injustices, abuses, and crimes of peace and war. As well as on US complicity with these. Stellar and careful reporting as usual, Max. -Not only do you give people the facts “after the facts”, but you put it in a historical perspective, and notice the direction in which things are going. [...] left paying ”Trail of Tears” bill as President Obama Responds by Doing Nothing!